Extra oscillator for cross-modulation; ribbon modes ensure pitch-perfect tuning. The Duo is all about the cross-modulation, inspired by Korg's classic early '80s Mono/Poly synth. Korg has included the ribbon modes introduced on the Monotribe, making it easy to hit the right note. The small red button on the Duo's back panel toggles between ribbon modes. The music world was taken by surprise in 2010 when Korg announced the release of a new pocket-sized synth. Could this really be Korg - committed digital hardware manufacturer - releasing its first new analogue synth for nearly 30 years? Even more surprisingly, was such a forward-thinking company really basing parts of the circuitry on designs found in its MS-10 and MS-20 synths of the 1970s? The hype turned out to be true and - despite its quirks - we loved the original Monotron, fiddly ribbon controller, noisy output and all. "As a pure synthesis tool, the Duo is significantly more versatile than the original Monotron." The Monotron synth engine was included in this year's Monotribe groovebox, suggesting that Korg was gradually working towards something bigger and even more impressive, so it came as another surprise when it was announced that two new models were being added to the Monotron range, the Duo and Delay. Korg obviously isn't quite finished with its analogue heritage just yet. Eagerly pulling the Duo from its packet, we find a unit based on the same form factor as the original, right down to the position of the five knobs and three-way slider switch on the front panel. Both Duo and Delay feature the same basic setup - ribbon controller, integrated speaker, headphone output, auxiliary input and compartment on the back for the supplied pair of AAA batteries. The differences start to become apparent when you check out the controls. The Duo (blue case, regular keys) adds another oscillator and a cross-modulation control to the original Monotron design. Meanwhile, the Delay (black case, reverse keys, funky Sci-Fi paint job) adds an analogue-style delay circuit. The Duo concept revolves around a relatively simple twist on the Monotron: inspired by the X-mod feature on Korg's Mono/Poly synth of the early '80s, Korg have added a second oscillator. The Duo's twin VCOs nominally produce square waves, but a quick check with an oscilloscope reveals that the shape is quite a bit more harmonically rich than a pure square, like a square with a bit of sawtooth blended in to add some bite. The real magic comes from the fact that VCO1's frequency can be modulated by the output of VCO2, with the level of modulation determined by the X-MOD INT knob. It's vaguely similar to the effect created by modulating pitch with the LFO on the original Monotron, but the Duo's two VCOs both respond to the keyboard input, rather than the modulation frequency being fixed. It takes a few minutes to get the hang of the Duo's options. With the slider switch on the VCO1 setting, only VCO1 is sent to the output but VCO2 can still be used to modulate its frequency. The VCO1+2 setting sends both to the output. VCO1's pitch adjustment has a range of around four octaves, while the range of VCO2 is also dependent on the setting of VCO1 - not in the sense that the audio output of VCO1 modulates VCO2, but that higher settings for VCO1 will also increase the pitch range of VCO2. If all this sounds a little confusing, fear not. The bottom line is that, just like the original, you don't really need to know how the Duo works in order to coax some great sounds out of it. With VCO2 pitch at lower settings, cross-modulation makes the sound get edgy and slightly atonal. Crank VCO2 up and it gets brighter and more cutting. To add to the sonic range, the classic MS filter section from the original Monotron is still present, sculpting the tone from mellow subby basslines to ear-splitting leads. As a pure synthesis tool, the Duo is significantly more versatile than the original Monotron. Of course, all this comes at a price. The Duo loses the original Monotron's LFO and with it the ability to modulate oscillator pitch or filter cutoff. VCO2 can be tuned down below the audio frequency range for LFO-style pitch modulation, but the wave shape and the fact that it tracks the keyboard make it sound quite different to the original. Likewise, the auxiliary input is still present in order to process any signal through the filter, but given that the Duo has no LFO you might be better off with the original Monotron if this is a priority. When we reviewed Korg's Monotribe we loved the introduction of the new ribbon modes - narrow, wide and chromatic - which affected the response of the Monotron-derived synth engine's tiny keyboard. In chromatic mode, the Monotribe quantises your finger's position on the ribbon to the nearest note, making it much easier to play in tune with other instruments. The Monotron Duo expands on the idea with Major and Minor modes, each of which limits the keyboard to a basic scale. A small red button on the back panel toggles between four modes: continuous, Minor, Major and Chromatic. Hooking the Duo up to a tuner with Chromatic mode activated, its oscillators track accurately across the full keyboard range with only a couple of cents deviation from perfect tuning. Korg tells us that an auto-tuning circuit is used to keep keyboard tracking stable at any temperature. Even taking into account the fact that the full keyboard range is only just over an octave, it means the device can be used to play melodies and riffs much more easily than the fiddly original Monotron. You'll still have to tune the Duo to your other gear by holding down a note and adjusting VCO1 until you hit the right pitch, but it's a small price to pay for near-perfect intonation. Of course, continuous ribbon mode is still available for FX sweeps and legato styles. I'm absolutely certain that Monotron owners will decide to add one or even both of the new models to their collection. The Duo's adoption of the Monotribe's chromatic ribbon modes make it a much more appropriate option for pitch-perfect melodies. At a bargain RRP of £42 for either of the new Monotrons, or last year's original unit, these are great value. 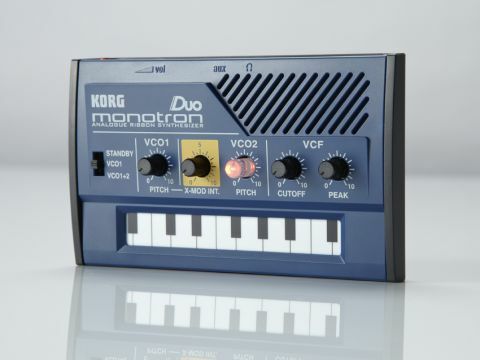 Our only real complaint is with the way Korg are drip-feeding us new features with successive Monotron and Monotribe releases. The company now has four different analogue devices on the market, each with slightly different feature sets. We know Korg can make stable analogue oscillators, awesome MS-style filters, step sequencers and analogue drum circuits, so doesn't it make sense to bring all those ideas together in the same unit? Modders will relish the idea of hacking Monotrons and Monotribes together to create insane custom synths, but the rest of us are desperate for Korg to cram all that technology into one box and release the brand new analogue synth we suspect the company's hinting at. So, Korg, what's it going to be next? Polytron? Drumatron? Or Monotron Pro? We can't wait.